The secretariat of the much talked about National Health Insurance (NHI), headed by Claudette James, was officially opened on Tuesday, 31 October 2017. Funding of over $600,000 for the secretariat has been secured from the India Brazil South Africa (IBSA) Tripartite Group. However, the United Nations Development Programme (UNDP), will have the responsibility to disburse funds and govern the secretariat. Prior to any disbursement of funds, the Ministry of Health and the National Insurance Scheme (NIS) Board, must first complete a project document to be approved by the IBSA funding group. Cutting the ribbon to the newly established secretariat, located downstairs the NIS building, was Minister for Health, Hon Nickolas Steele, who asked the rhetorical question, “If not now, when?” According to him, this day must be marked as a very important milestone in Grenada’s history, as the government continues to take steps toward ensuring that all Grenadians have access to affordable healthcare. 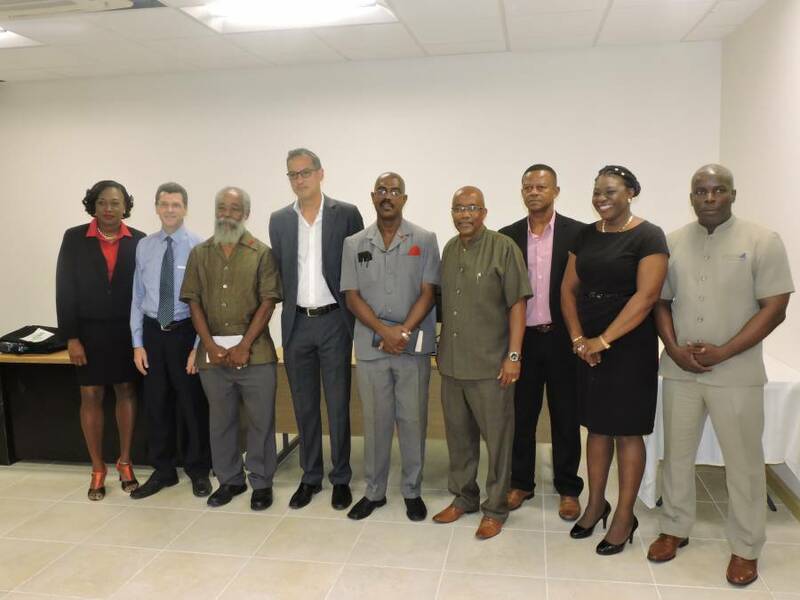 “The ultimate goal is to improve health care in Grenada, [and] to stand by the principles of the Ministry of Health that health care should always be accessible and affordable,” Steele commented. Deputy Director of the NIS, Dorset Cromwell, reiterated some of the functions and duties of the NHI’s secretariat. These include supporting the UWI Consultancy, disbursement of funds provided, initiating of an IT consul for securing the necessary IT infrastructure, developing of a communication strategy, as well as to liaise with Actuaries for delivery of reports and possible updating of actuarial reports. With relations to funds, the secretariat will also ensure that there is no co-mingling of funds. The UWI is tasked with the refining of the basket of services to be offered by the NHI. Their technical work is expected to commence soon. According to Cromwell, the basket of services, refers to ‘what it is that the NHI is offering to the general public,’ and it needs to be detailed. Representing the UWI, was Professor Carl Theodore, who, on many occasions, referenced the high costs of healthcare worldwide. “One of the problems with the health systems all over the world is that costs keep going up, up, up.” This can be regulated and controlled to an extent, through the implementation of the NHI, and it will be able to keep track of the quality of services being offered as well. Before the government is able to actualise the basket of goods and its costings to the Grenadian public, they must review the findings of an Actuarial study which was done by Morneau Shepell, a Canadian-based firm. The study was also handed over by one of the firm’s representatives to the Minister for Health.